Cloudy early with some clearing expected late. Low 37F. Winds SSW at 5 to 10 mph..
Cloudy early with some clearing expected late. Low 37F. Winds SSW at 5 to 10 mph. Former Secretary of Defense Donald Rumsfeld talks Wednesday at his ranch on the Big Hole River outside of Twin Bridges. The retired Rumsfeld spends part of his summer in southwest Montana with his wife of 56 years, Joyce. 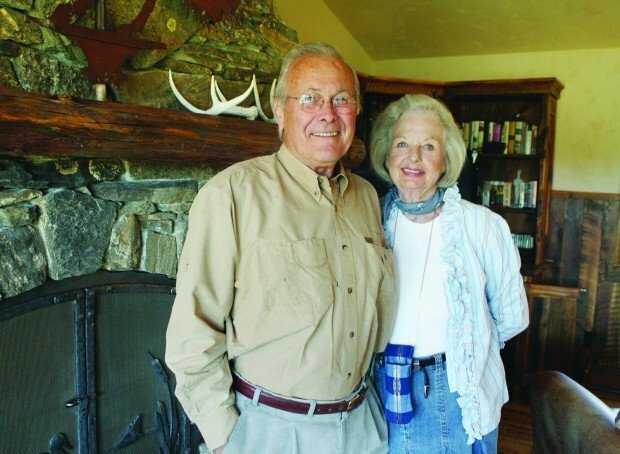 Rumsfeld and his wife Joyce, both 79, recently purchased the ranch outside of Twin Bridges. Often Rumsfeld gets a box of papers delivered by the FedEx man, who brings treats for his dogs. TWIN BRIDGES — As the 10th anniversary of the al-Qaida attacks on the United States approaches, the man who crafted America’s military response in both Iraq and Afghanistan believes that the terrorism threat will continue to evolve — and the country’s defense systems must remain well funded to be vigilant. 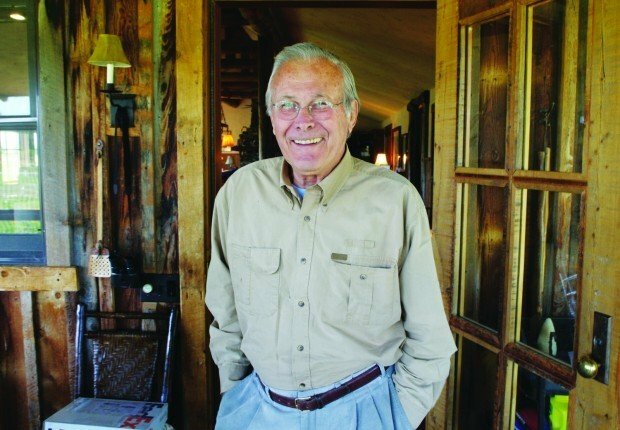 Donald Rumsfeld, secretary of defense for presidents George W. Bush and Gerald Ford, is retired and spends a portion of his summers on a gentleman’s ranch along the Big Hole River in southwest Montana. His 40-plus-year career as a public servant spread across some of the most turbulent times in this nation’s recent history. country,” Rumsfeld told The Montana Standard during an interview at his home one sunny morning last week. “The casualties could have been a lot higher — 300,000 rather than 3,000 — had terrorists employed biological weapons (spread across the country). “Throughout history you’ll find that every time there is a retrenchment in funding for the military, the United States becomes involved in a war,” Rumsfeld said in a wide-ranging interview. A couple of years ago, Rumsfeld and his wife of 56 years, Joyce, purchased a verdant river bottom spread of about 1,000 acres just a few miles out of Twin Bridges in Madison County. The town has a quarter-mile long main street and sports a couple of taverns, restaurant, grocery store, barber shop and a fly-fishing store. It sits at the confluence of the Beaverhead and Big Hole Rivers, fed by surrounding mountains and forming the headwaters of the Jefferson River. The rivers are a life source for many wheat and alfalfa farmers and cattle ranchers. The Rumsfelds’ modest, one-story log cabin home and outbuildings southwest of town are surrounded by freshly mowed hayfields. A lush trout pond sits nearby the compound. Bluebirds, sage grouse and the occasional jackrabbit dart in front of the pickup as it ambles down the washboard dirt road toward the spread. A towering 50-foot flag pole sporting the stars and stripes stands near the entrance to the ranch — a sure sign that the Rumsfelds are home. Asked about the most difficult part of being secretary of defense, Rumsfeld didn’t hedge: It was the decision to send America’s youth off to war, Rumsfeld said. “You know that lives will be changed, lives lost, families changed forever,” he said. “Joyce and I would visit the wounded soldiers at Bethesda Naval Hospital or Walter Reed Army Medical Center. We always get ready to go in after church and a man would meet us with a handful of 40 or 50 cards detailing who they were, what happened, where their hometown was, what their prospects were. “And you wonder to yourself, what in the world can you say to the soldiers to make them appreciate how much the country respects and appreciates them? How do to you talk to the family member whose youngster has lost an arm or leg or has brain damage? Don and Joyce, both 79, and high school sweethearts, have always wanted to return to Montana. For a time, while living on Chesapeake Bay, the couple’s neighbors were from Butte. Another Montana tie was when Rumsfeld became well acquainted with Senate Majority Leader Mike Mansfield, the noted Democrat from Montana. Rumsfeld had kept in touch with Mansfield after he was named ambassador to Japan. And he visited often when Mansfield was hospitalized and close to death. The Rumsfelds winter in Taos, N.M., and also run the Chicago-based Rumsfeld Foundation, which supports U.S. military and veterans’ charities. Rumsfeld, once an Eagle Scout, had worked as a guide in New Mexico and wanted to return there as well. “And we wanted our children and grandchildren to have some linkage to Montana,” Rumsfeld said. For now, he and Joyce are enjoying the Montana summers, spending time on the ranch with their children and grandchildren. “It’s just spectacular here,” he said. — Gerry O’Brien is the editor of The Montana Standard and the Helena Independent Record.